Australia’s high country is steeped in history. South Eastern Australia has a history that goes beyond ski clubs, hydroelectric schemes, high country grazing and gold mining. It goes beyond the exploration of Hume and Hovell and colonial exploration. But now - it's increasingly about mountain biking. 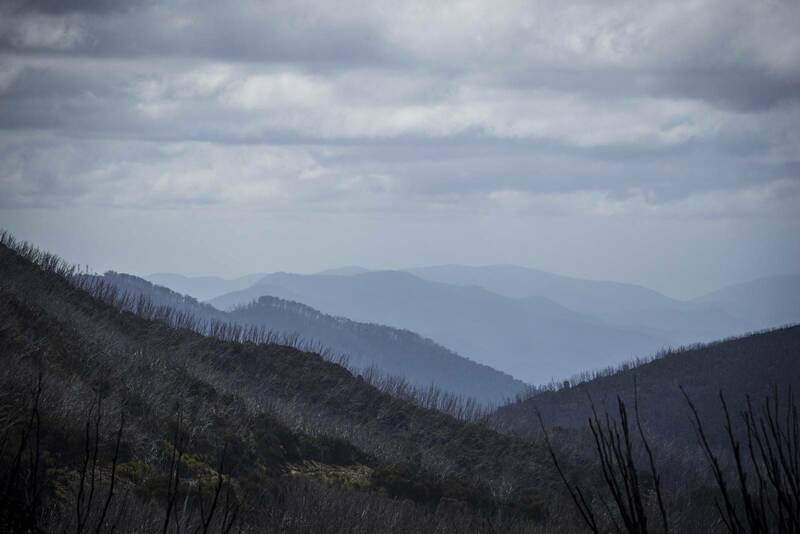 The history of the high country goes back over 20 000 years to when Aboriginal people travelled to the high country for an annual summer feast on Bogong moths. The alpine areas offered something unique, and the summer months were the time to visit. The high country has played a role in supplying our country with resources, power, jobs, somewhere to live and a place to play. Few people travel to the alpine areas to feast on moths these days, but instead people come to play in the great outdoors. 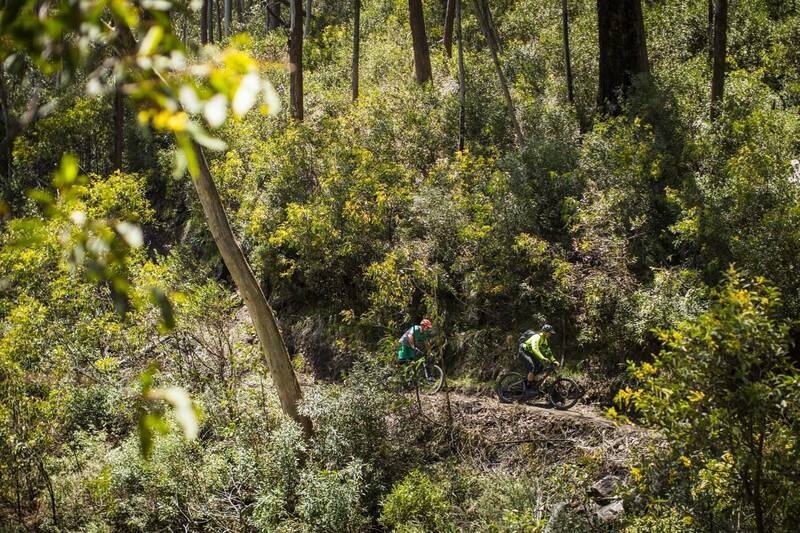 The high country is an immense playground for hikers, skiers, 4WD enthusiasts, fly fishers, bird watchers, road cyclists, runners – and of course mountain bikers. 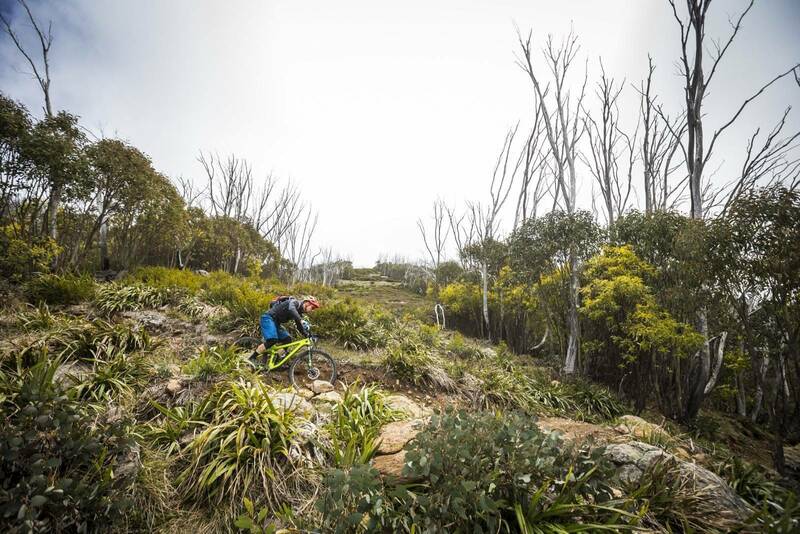 There are vast tracts of alpine bushland, but it is the network of old trails and new that create the labyrinthine map of joy for fat-tyred enthusiasts. 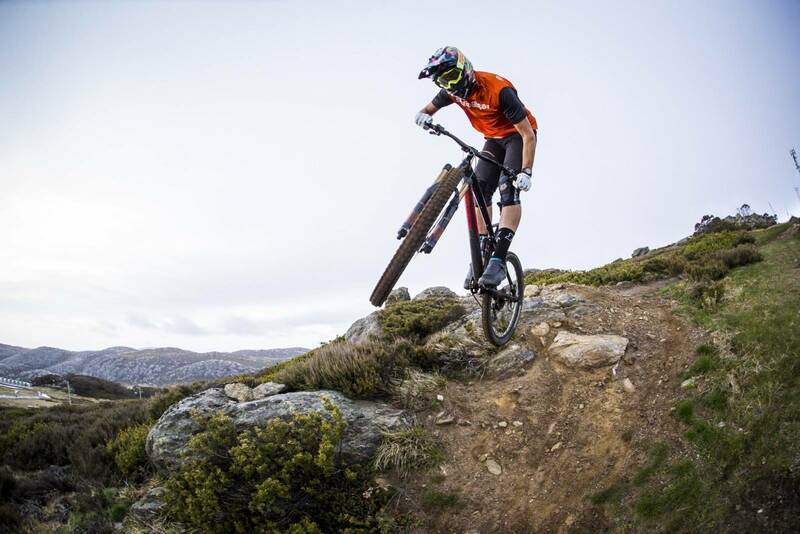 Falls Creek sits over 30km beyond the mountain bike hotbed of Mt Beauty, an area that has turned out mountain biking dynasties such as the van der Ploegs and Panozzos. 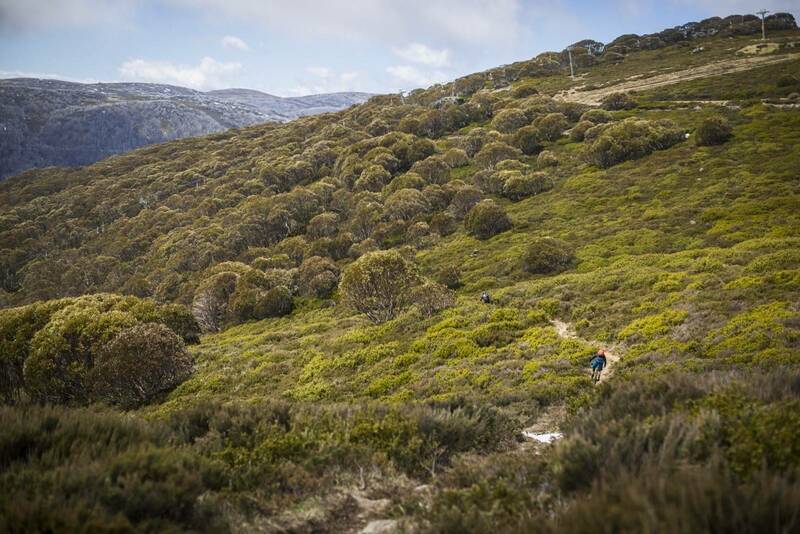 But while Beauty was hosting national series events and national titles, Falls Creek was sitting alone up the range, with acres of alpine bushland, and countless kilometres of backcountry trails to explore. 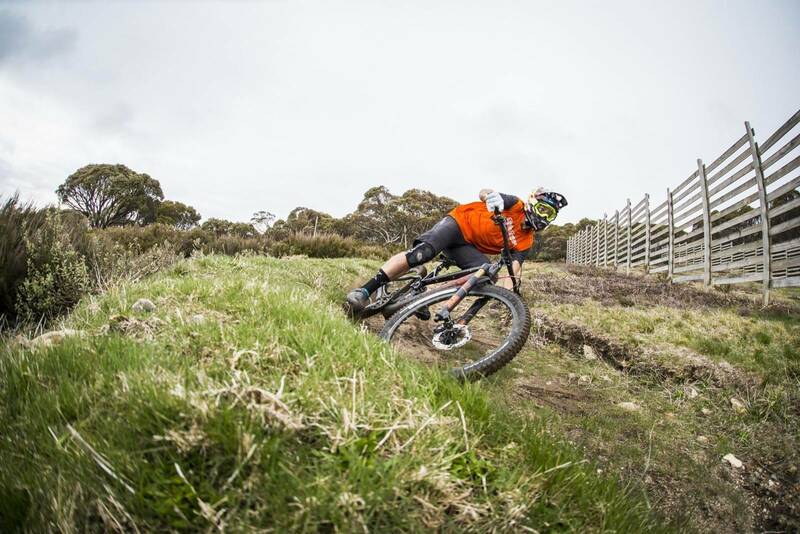 Falls Creek has only really etched itself onto the mountain bike map in the last few years, with a real push to capitalise on their location. 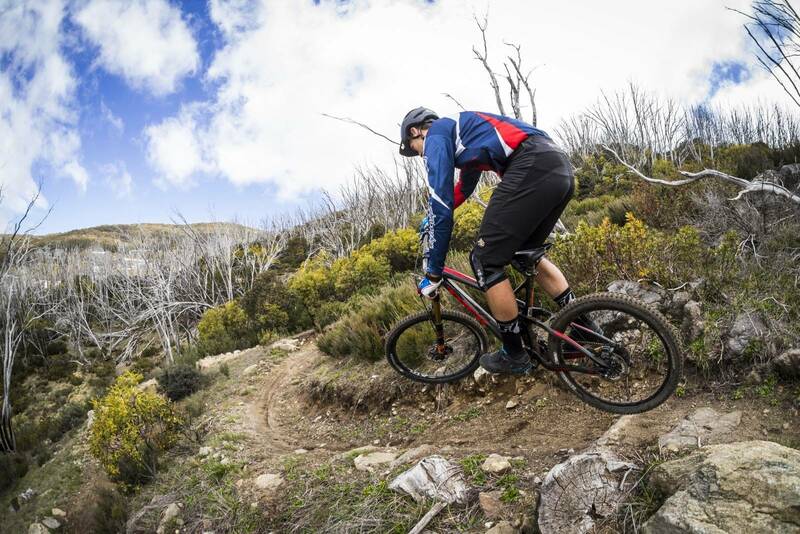 With such vast amounts of bush around, plus service trails, fire trails, olkd walking routes, cross-country ski routes and a lot of flatter ground at altitude - Falls Creek could well become more than just an ideal mountain bike holiday location. 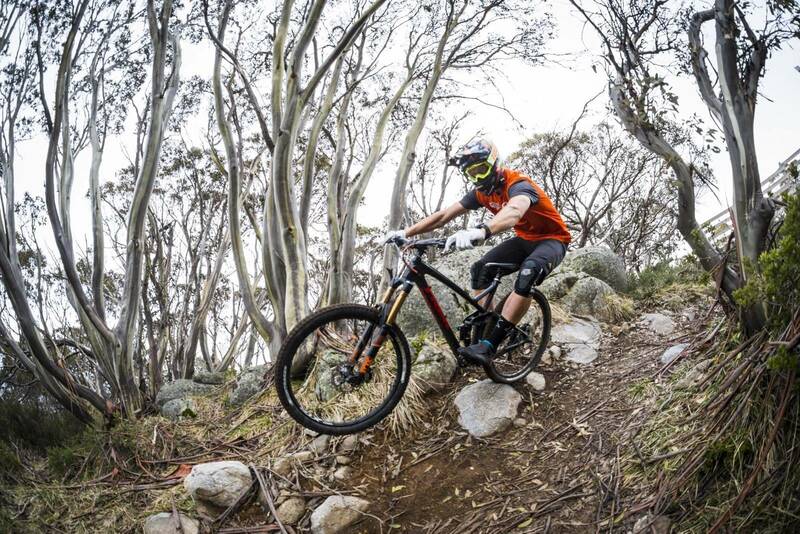 Falls Creek is also well-placed to be an altitude training base for mountain bikers. 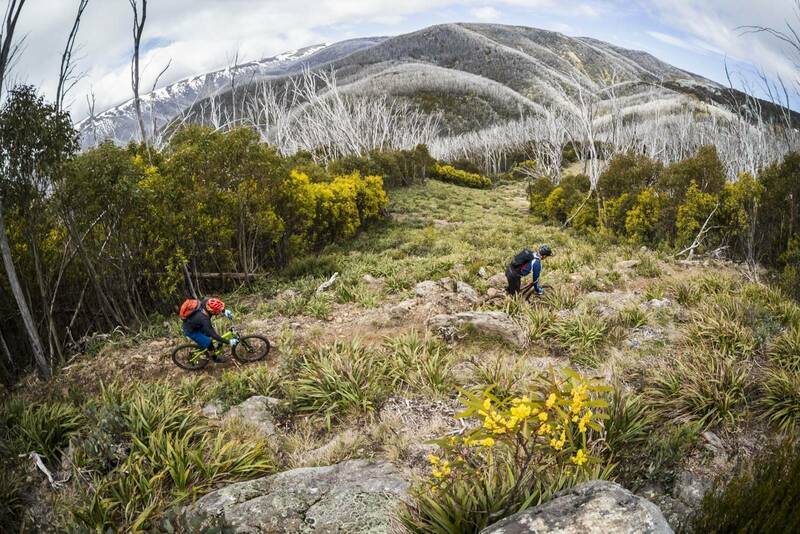 Known as an ideal alpine resort in winter, with a ski in, ski out village and one of the best views in the Australian Alps – Falls Creek has rapidly become a must-ride location for riders who want to head to the high country for a summer feast of singletrack – and their latest trail openings reinforce that. All the aspects that make Falls Creek great in winter spread to summer as well. The village is compact, with a focus drawn into the Slalom Plaza, between the buildings of QT Resort, with the Bike Hub at the Village Trailhead run by Blue Dirt across the road. That same winter’s view across to the ridges and down the valley remains in summer, the sunsets are just longer and more drawn out. It’s an intoxicating view that is enjoyed from the seats outside the Stingray restaurant, trails above the tree line, or on your balcony after a long day on the trails. Arriving into Falls Creek is a little different to some of the other alpine resorts. While the uphill drive is not unique, nor the stark beauty of large stands of eucalypts killed by bushfire, it’s the feeling of arriving up high that is a little different. In Thredbo, you arrive at the foot of a hill, and at Mt Buller and Mt Baw Baw while you are very close to the top, you know there is more above. Somehow, with the village at Falls Creek placed on the edge of the valley, where the road beyond starts to flatten out towards the lake above, it feels like you’re just about at the very top. It feels like you have arrived at the peak. In reality the village sits at 1600m, and the highest trails in the resort are at just under 1800m. But when you follow the road (or Aqueduct Trail) to the Rocky Valley Lake foreshore, you have a sense that you’re on the roof of Australia. 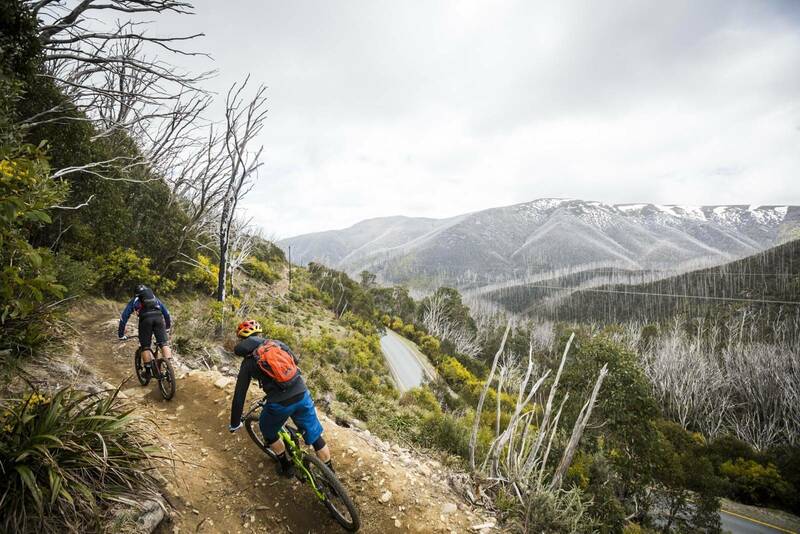 And while that right is reserved for NSW and the Kosciusko National Park – there’s much more mountain biking opportunities on this alpine plateau. But while you can easily feel like you’re completely removed from any nhustle and bustle when up near the lake, or on some of the older trails in the park, the reality couldn’t be different. The village is fully functional in summer, and the Stingray restaurant at QT Resort is open every day for breakfast, lunch and dinner through summer. 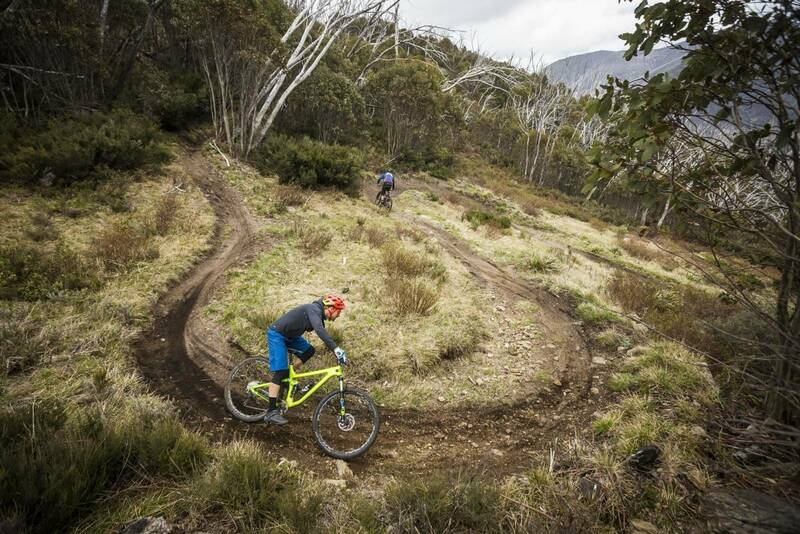 With more operators opening in summer, Falls Creek has really come of age, and is set to be a vibrant summer village for those who visit to quench their thirst for sublime singletrack. 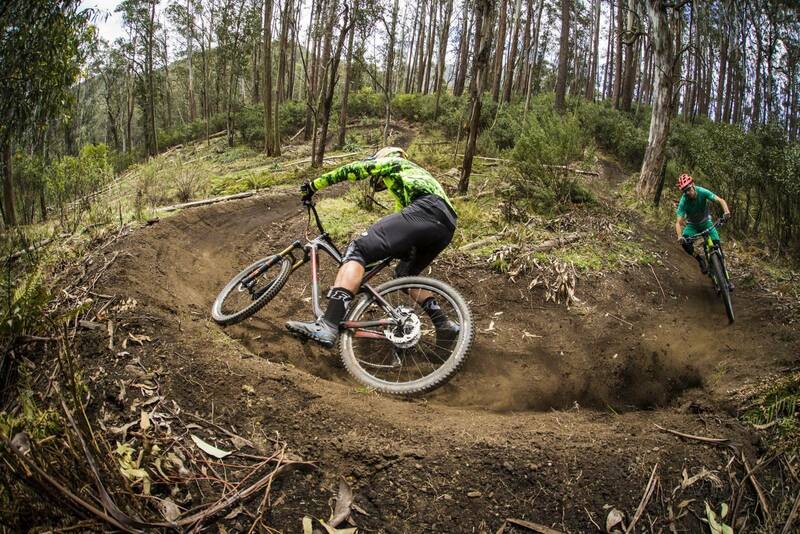 Falls Creek have been investing heavily in their mountain bike trails, and having visited two years ago, the upgrades are noticeable. While in early 2014 there was a good selection of intermediate trails, plus some heavily gravity assisted trails, I certainly looked enviously at some of the surveyors tape that created lines through some of the low alpine shrubs. It was clear that Falls Creek were planning for a big future, and World Trail were in the midst of a multi-year operation. Visiting with Chris Panozzo and Tim Bardsley-Smith in November revealed what had been under development. While in late 2015 World Trail had been hard at work on the trails above the lake, ahead of their opening weekend this November, the real jewel in their crown was Flowtown. A 6.5km descending trail from the village to the ticket box, Flowtown is a trail you could pump all the way down, with nary a pedal stroke. 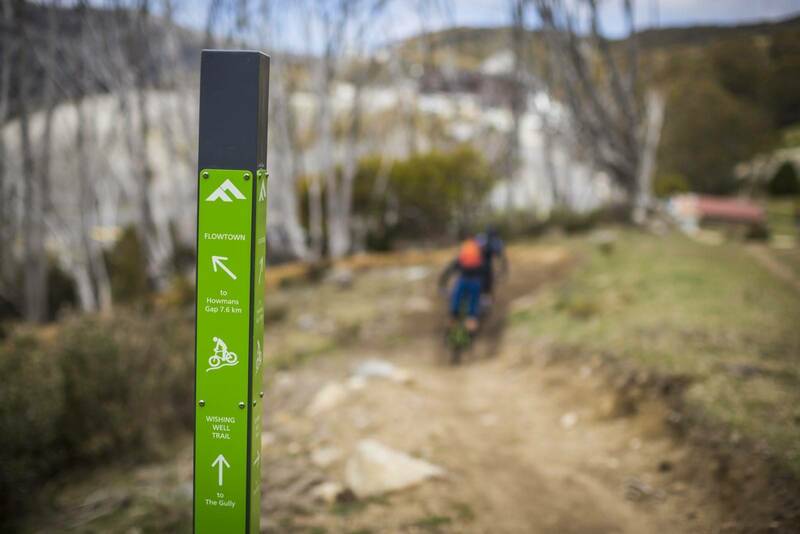 But more than just ‘another gravity assisted trail’ Flowtown acts more like a missing link – and a link that isn’t always worked into trail plans at other alpine resorts. Glancing at the Falls Creek trail map, you can see that like snow, or water, or ski runs, the trails run down hill towards the village. Everyone likes to point towards home, and this is certainly the best way to make the Blue Dirt shuttles work the best for riders and the shuttle operators. But the trails aren’t wholly dependant on the shuttles running, the network of singletrack has been designed so you can work in lots of rideable loops, so you can find some manageable climbs up, or short cut across the slope, to put together a compact loop or epic ride encompassing many of the resorts purpose-built trails. With advanced and intermediate trails running from Cloud 9, the Summit trailhead and The Trig, your options for places to start at just under 1800m aren’t limited. Any of these launching points have you above the trees, following trails that have either been carved into the ski slopes, or milled out of the dense alpine shrubs and low lying trees. Falls Creek is a mix of dry soil and rock, and more often than not when you expect a trial to be smooth and flowing loam, it turns into a surprise rock garden. The whole area has a lot of rocks, and the relatively thin soil above it all means you’re always on your toes. But while the constant changes in terrain might be challenging for raw beginners, it’s this changeable element that means the trails change their character with use, and keep intermediate to advanced riders entertained. Our trio dropped in from high on the mountain, and while we had a couple of snow patches to negotiate in the early season, the ground was dry and the trails were clear. We rode from the Summit trailhead down Thunderbolt, through the tight turns and low-height alpine scrub. Chris Panozzo seemed to find every feature, using anything at hand to find faster lines through or over parts of the trail. We burst across the Aqueduct Trail and into the Village Bowl, where Chris did his best to freshen up the final berm as Tim shot with his camera incessantly. The Aqueduct Trail is the easiest trail at Falls Creek, but it’s also the most useful, linking from the top of Wishing Well through to the Lake Foreshore, with hardly any change in altitude – just enough for water to flow. We jumped on the trail and headed to the top of Wishing Well, an intermediate trail that cuts through stands of trees, across theface of some ski slopes, and over some rocky outcroppings. We could have riudden from The Trig and straight down High Voltage to this point, but sometimes it’s nice to maintain your altitude and not use it all at once! The bottom of Wishing Well runs into Flowtown, and we were some of the first riders to get our tyres onto the trail. At about 6km long and with almost 300m of elevation loss, Flowtown hits the mark on being shallow enough to not be torn apart by braking bumps, but with enough elevation drop to allow riders to work the trail for free speed. Up top there are a few tighter corners, before the trail benches in using the clearing for line servicing. As a result, the trail is pretty open, which gives not just an expansive view over the trees and across the valley, but also down the trail as well. 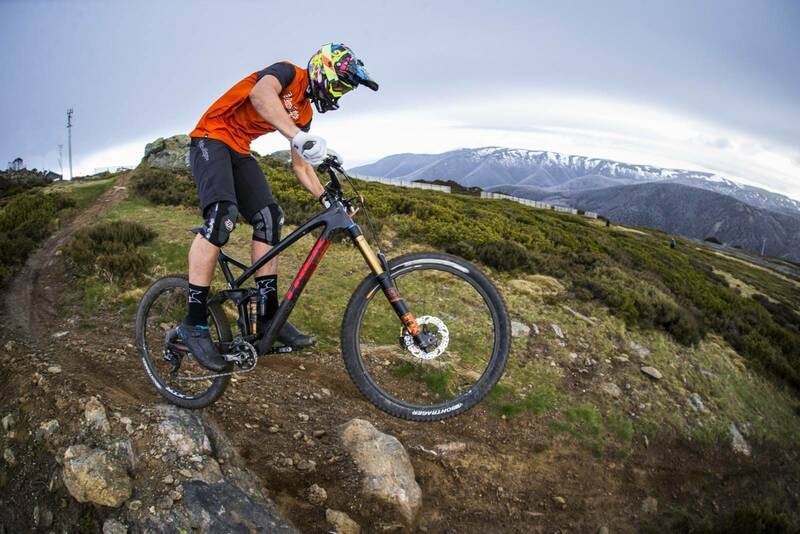 This long line of sight can be missing on some of Australia’s alpine trails, and the gradient allows for a lot of speed, while the line of sight means you can charge the trail in a relatively safe manner. Just as before, Chris found the small features to turn into big moves, boosting off ledges and over gaps that plenty of riders might not have even seen. Flowtown descends well into the trees, and it’s not just the tall stands that surround you. 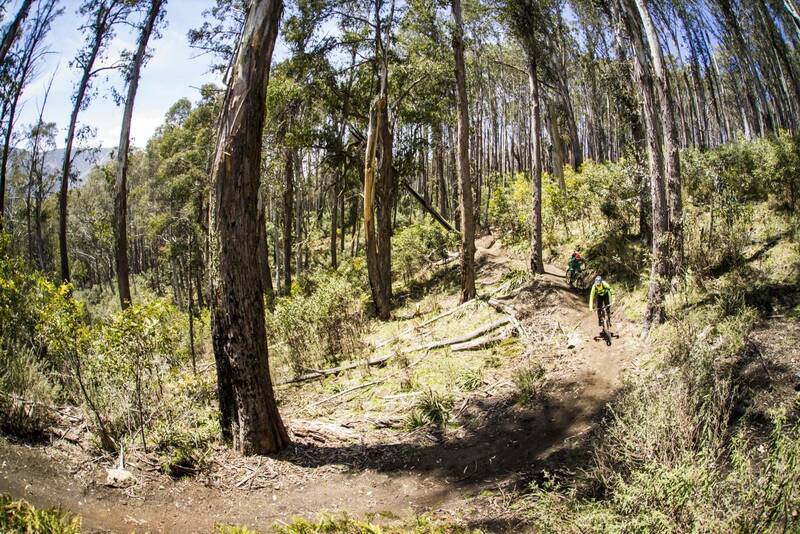 As the trail descends, the soil changes, closer to the black dirt you find at Mt Buller. The trees are taller, but not all of them make it through winter. You whizz past mammoths that have fallen down, the trail builders having cleared the immense trunks at the end of winter. Just as the trees are getting bigger, the rollers and berms are too. With greater speed more lines open up, but at the same time this isn’t a bike park trail. Entering some of the sections with too much speed will send you off line, or leave you pushing too far onto a soft edge and into the forest. 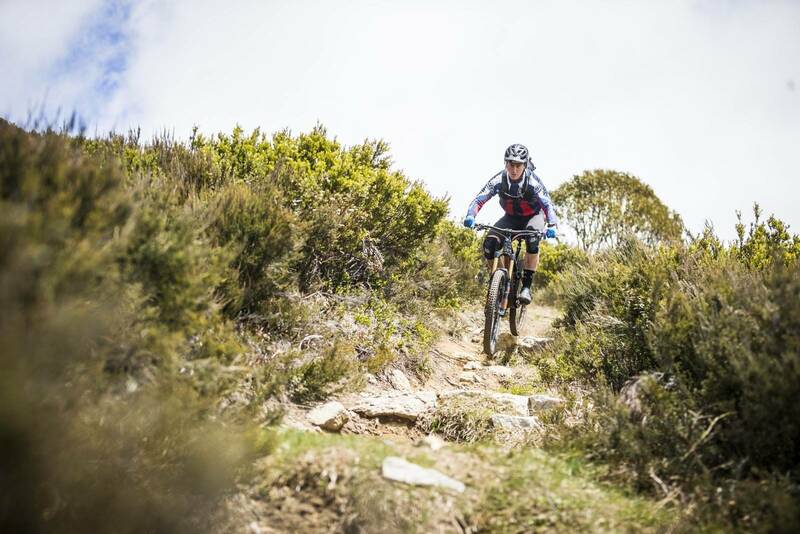 Like any good trail, it rewards precision and finesse – not just all out aggression and speed. 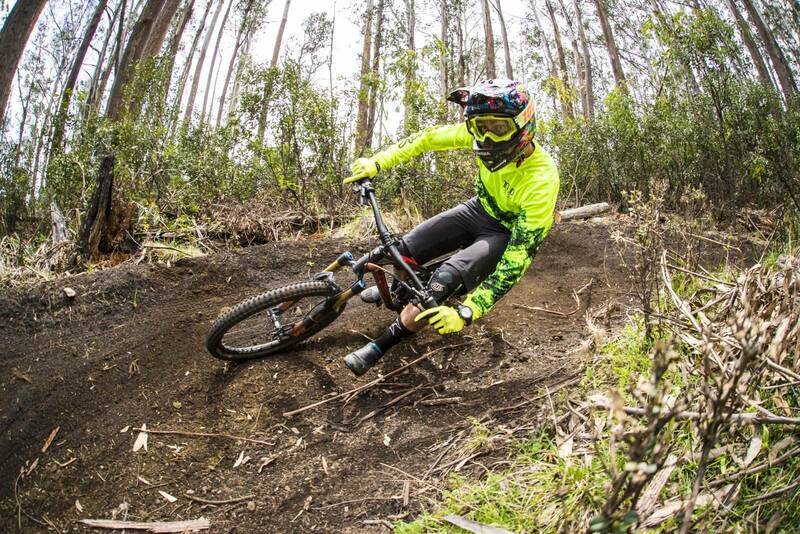 Stacked berms control your speed before spitting you out before the ticket box, down at 1250m. The tall trees knock and sway in the wind, and the scent of eucalyptus is strong, a distinct change to higher up the mountain. While the Blue Dirt shuttle service will be a welcome sight at this point, especially given how fun the previous trails are when hitting the pedals hard out of corners, Falls Creek have intelligently made sure there is a climbing trail to keep off the road for those who want to pedal back up. Just across the road, the Packhorse Trail meanders back to the village. It’s a much older trail, and as the name suggests it used to be the way up the mountain for those with packhorses. But this is a gift to mountain bikers, as the gradient is manageable, although some effort will need to be put in on steeper pinches. Like most old trails, the Packhorse Trail has settled into its surroundings. It’s a narrow bench, with a few single steps to lift over, and rocks to avoid clipping with your pedals. The climb leads right back to the Village trailhead, or you can carry on into Discharge, Induction, and hop onto the Aqueduct Trail to join Turbine, then Generator to climb back to Cloud 9 and a finish down Vortex, right to the bar. It’s an awesome alpine loop, with plenty of ways to modify it to suit your fitness, skills and riding preferences. 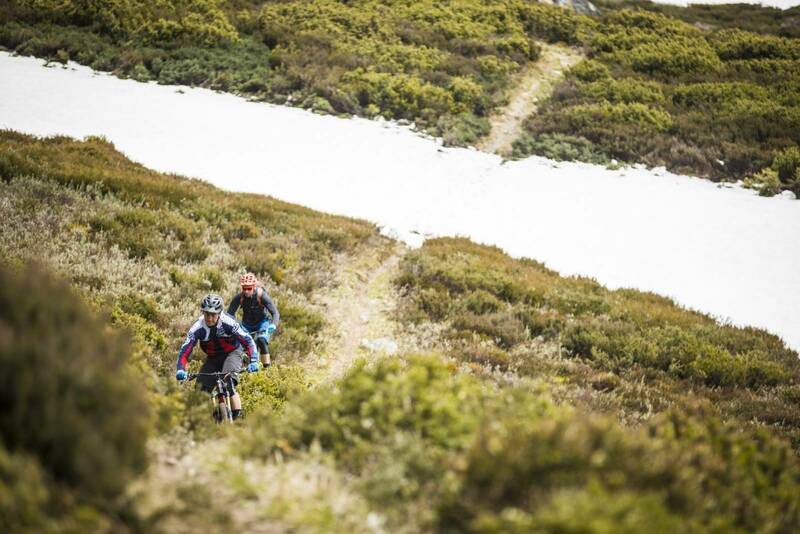 Whether you’re going with shuttle assistance and aiming for more runs, or running only on pedal power, a visit to Falls Creek gives you lots of options. But the broadest scope lies beyond the resort trail map. A vast network of firetrails and aqueducts run beyond the village boundaries, and while there are planned routes to Mt Nelse, Tawonga Huts, Cope Aqueducts and more – you really want to go and grab a topographic map and explore the options provided by the Fainter Firetrail, or the Big River firetrail, which can lead you all the way to Mt Beauty. There’s enough to explore in this part of the high country to keep adventurous riders entertained. That is, if you can draw yourself away from the mapped and signposted resort trails, comfortable views and amenities of Falls Creek resort. 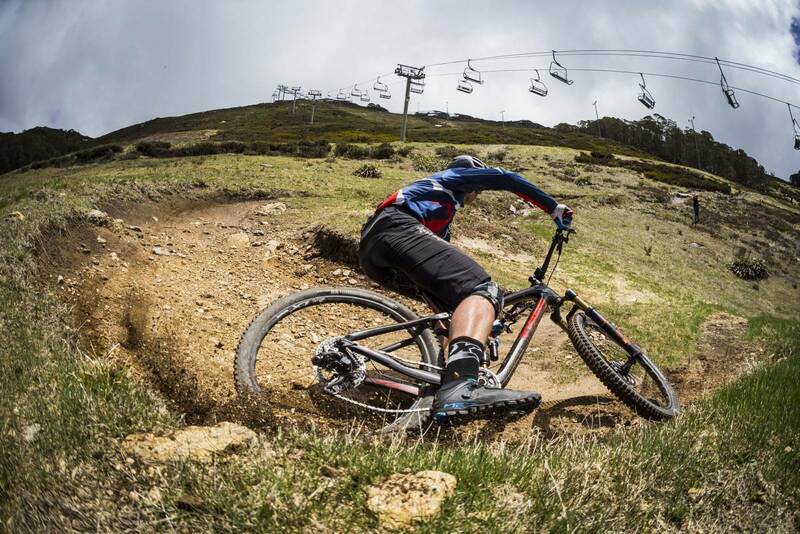 When I visited two years ago, I knew Falls Creek had the most potential out of the Australian alpine resorts, to offer something for the majority of mountain bikers. While it doesn’t have the sheer drop and 7 day a week chairlift of Thredbo, Falls Creek has a sinuous network of trails, with a mix of older riding and new, and a vast backcountry to explore on long summer days, and even through long summer nights for those with the experience to feast on the sublime riding in Australia’s high country. Sometimes the seasons don’t comply, but in general; the best riding is from mid-November through to late April (23rd in 2017). From Christmas to early January the village is pretty packed – which is awesome if you want to bump into new people to ride with. If you’re more of a solo operator, or prefer to explore with just a few mates, try early December or early February. Part of the beauty of Falls Creek is how accessible all the trails are without shuttling. But shuttling is also good, as it means more runs in less time! Blue Dirt runs shuttles every weekend from November 19th until April 23rd. The village is central to all the trails, so you’re never going to be sleeping far from singletrack. We stayed at QT Falls Creek in an apartment, which meant we had a kitchen, full bathroom, laundry facilities, Wi-Fi and secure bike storage – plus a killer view down the valley. There are apartments for individuals or larger groups – just get in touch for options. The Falls Creek website also has an accommodation booking service, so you can play with dates and budget to find something that suits. Stingray is at the base of QT Resort, and is open for 3 meals a day, but if you’re riding until sun down you might have to head to the The Last Hoot, this pub is just on the other side of the Village Green. The Village Bike Café is right at the main trailhead, and is a perfect place to grab a coffee or something to eat. There’s a small supermarket right opposite the trailhead, so you can pick up supplies for your backpack, or to cook up a storm after a long day on the trails.